What are Internet Drop outs and How do i know when the internet drops out? Let’s face it the Internet is beginning to come something we can’t live without, From running the home devices such as Tv’s, Computers, Playstations, Xbox and security systems without internet we can’t use these devices. With the NBN being active in most of the Bundaberg CBD and surrounding areas such as Svensson Heights, Bundaberg East, Bundaberg West, Thabeban and Bundaberg North its a quite common for people to still experience a so-called “Drop-out”. But what is a “Drop-out” and why do we experience them and how come some people experience them more so than others. An official drop out is when your Internet Modem or Router, loses a stage called “Sync or DSL” depending on the manufacture of your Modem. Your modem requires 3 stages to officially connect to the internet. Power! Of course, the first stage is having your modem connected to power our best suggestion is ensuring it is connected via a surge protector as most modems can be quite expensive if a storm happens to strike your house and travel through your power points it can be one of the first devices to blow up. The next stage is “Sync or DSL” this process is proving that the internet can successfully travel through your telephone line leading into your house and wall socket. Most modems this light should either blink or provide a steady blink rate. Internet, This stage now Authenticate your Username and Password in which is given to you by your Internet Services Providers such as Telstra, Optus, Westnet, TPG or IInet. Once this light turns from either “Blank or Red” to Green your now able to connect to the internet. The remaining lights which are located on your Router are normally Wi-FI, LAN and Phone, These lights will only be green once they have been enabled or devices are plugged into the back of your Router. I’m losing internet or Experiencing Dropouts? Are your devices connected via Wi-Fi to the Modem/Router? Where is the modem located? is it near Microwaves, Tv’s, Brick walls etc. How old is the Modem or Router? Is it a brand named modem such as Netgear, Tp-Link, D-link or is it one provided by your Internet Service Provider? How long is the cable coming out of the Telephone socket in your house that leads to your Modem or Router? Is the modem near large aerials or Radio controlled devices? For further information regarding Internet Drop-outs please get in touch with us we provide a range of Internet repair services and have all the equipment to test all your lines which Telstra uses on a daily basis’s. We can also locate problems on your line leading onto the Telstra or NBN network. Click Here to be taken to our contact page or To view our Telecommunication Services Click Here. In the last couple of days, we have been getting numerous phone calls and emails regarding issues with sound after the recent windows updates from Microsoft. It’s just one of the many problems Microsoft has to come to terms with after the latest October update reportedly deleting users files as well as uninstalling users keyboards and now losing sound altogether. While Microsoft is yet to comment on this latest issue that comes to surface its also becoming a hot topic on social media platforms such as Twitter and forums such as Reddit. Users are stating their Windows 10 system is simply stating that Windows says there is “No Audio Device Installed”. It is affecting users in which have either Realtek, Intel or other leading audio drivers installed on their Windows 10 Desktop or Laptop. We have listed below two possible solutions to resolve this problem below in which we have found to work on a number of our customer’s systems and they are also being used on the internet to also resolve the same issue. 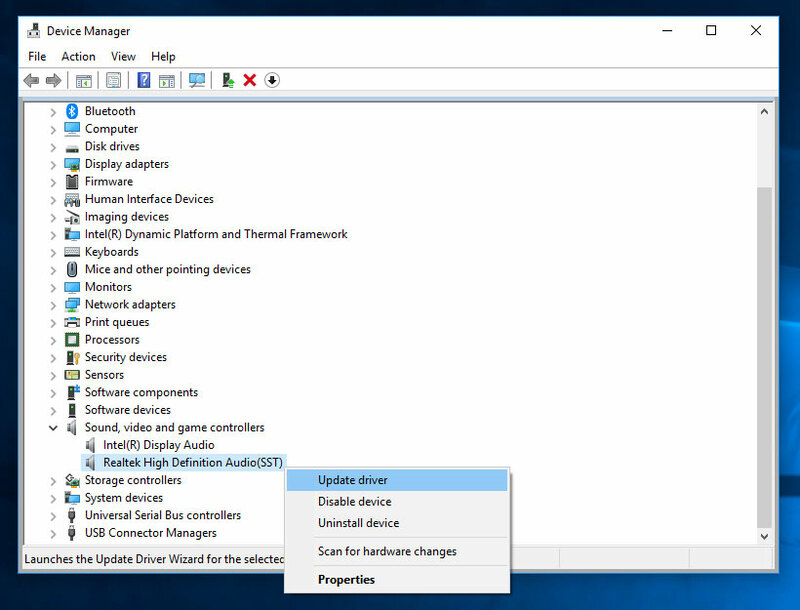 An Intel audio driver was incorrectly pushed to devices via Windows Update for a short period of time earlier this week. After receiving reports from users that their audio no longer works, we immediately removed it and started investigating. If your audio broke recently, and you’re running Windows 10 version 1803 or above, please check to see if the incorrect driver was installed. To regain audio, we recommend you uninstall the driver. You should get a dialog like below. Click on the Driver tab as shown. If the driver version is 9.21.0.3755, you have the driver that was sent to you incorrectly. Click Uninstall Device. You will get a popup asking if you want to remove the driver too, as shown. Check the checkbox as shown, so the driver will be removed. When the driver is uninstalled, reboot your system. Your audio (speakers and headphones) should now work. ^ This is actually what a Microsoft Employee has suggested. Open the Windows 10 Device Manager by right-clicking the Start button and then selecting Device Manager as shown below. Scroll down and expand the section called Sound, video and game controllers. You should now see a list of audio devices. 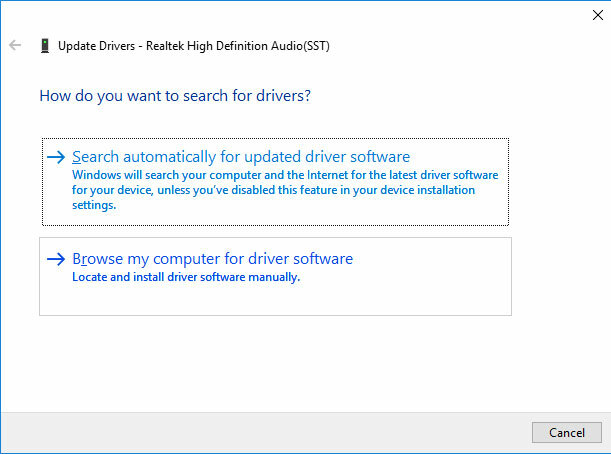 Look for a device that has SST as part of the name, right-click on it, and select Update Driver as shown below. For example on my computer it was called Realtek High Definition Audio(SST). Others have seen Intel Smart Sound Technology driver (SST). A window will open asking if you want to search or browse for a driver. Click on the Browse my computer for driver software. At the next screen, click on the Next button. Then select High Definition Audio and click Next. 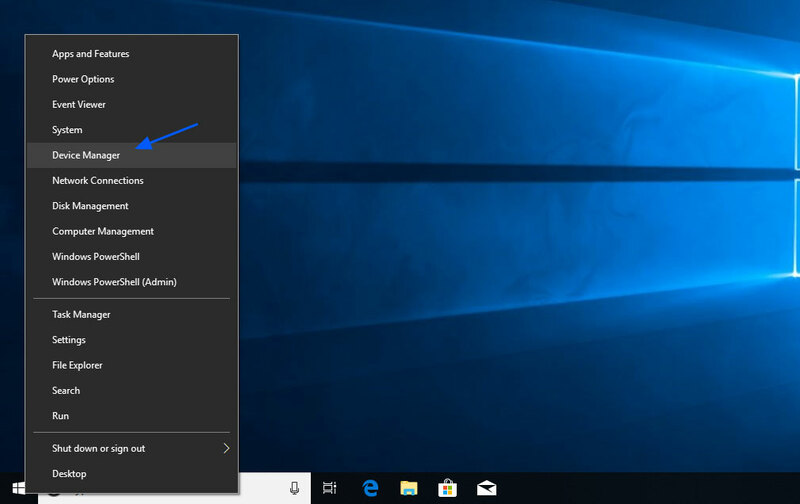 Your audio should be now be working in Windows 10. For further assistance, we can organize for an On-site appointment or may be able to assist you via Remote Support. Visit our Contact Page to get assistance now or phone us on 0435613748. Storm season is here already! Well, we’ve had our first Storm for the season and while it didn’t stay for long it surely didn’t need to as it caused a significant amount of damage in the surrounding areas of Bundaberg. Did you happen to lose power at home or work? Hopefully, you weren’t completing uni assignments or entering expenses in for the business on the computer because you may have lost that information and had to start over again. While we didn’t have a lot of lightning strikes directly in Bundaberg we ourselves did witness some big ones around the CBD area. Lighting strikes and electronics don’t go well together lightning strikes that cause the power to trip or go out can damage electronic equipment to the point where it cannot be repaired. Having your electronic equipment such as TVs, Desktop Computers, internet modems/routers, Mobile Phones etc directly plugged into a PowerPoint without a surge protector can be bad news for that equipment. Depending on the brand that you wish to purchase it may have one outlet to simply protect your TV or multiple outlets to service your computers, mobile phones, and other devices. Ones such as pictured above will protect a number of devices and depending on how much you spend brand names such as Belkin will also come with insurance and cover costs for any damages to devices. if you’re looking for a solution to provide you with time to save documents or to be able to use your computer for an additional amount of time when storms first come you may be looking to purchase a UPS. Essitonally a UPS is a sealed battery that stores energy for when the main power supply coming from your house or office is interrupted. 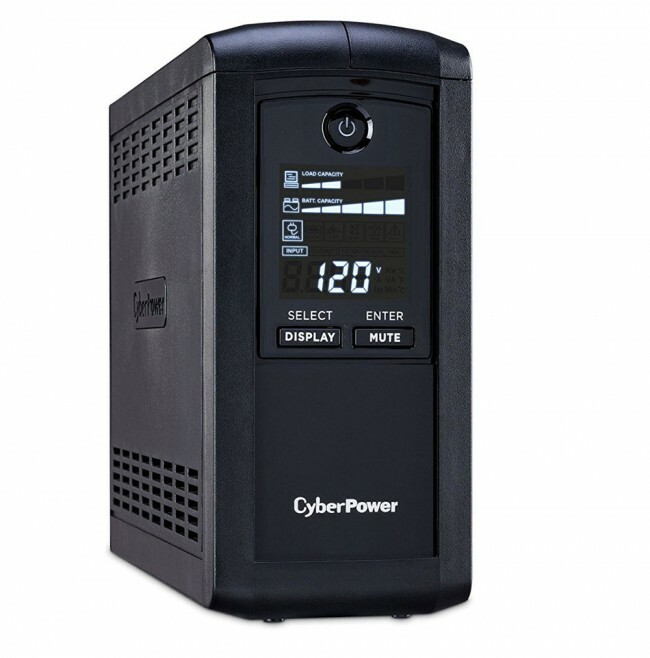 Depending on the size of the UPS you purchase it can give you enough time to safely power down devices or give you enough power to stay online that little while longer. Bundaberg IT Solutions can perform a FREE onsite analysis to give you a quote on the correct UPS system for your home or office. Rather than walking into a shop and just purchasing a device off the shelf get the expert solution and only buy the device to do the job right the first time. For further information click here to be taken to our contact page. From Computer Repairs, Tablet Repairs, Mobile Phone Repairs, Telecommunication Services, Website Services, Search Engine Optimization Services and Data Recovery Services you no longer have to look elsewhere when it comes to IT, Website Services and Telecommunication Services in the Bundaberg Region. Sign up to our Newsletter where you get the latest information on Technology Tips, Latest Scams and Viruses, Discounts on Repairs and more!.